Sticky notes (25 and 100 sheets) with page marker set in 5 colours. Dimensions: 7,8 x 10,5 cm, .. Pack of 3 Notebooks in A5, A6 and 9x9cm size with musical notation designA5 – 32 sheets wi..
With a bold design featuring Piano keys, this Little Snoring A5 Hardback Notebook would make an idea..
A ring bound magnetic shopping list approx 9,5 cm x 21 cm in size which contains about 70 sheets of ..
A6 Hardback Spiral Bound Notebook – Black With White Musical Notes..
Spiral notebook with black music notes on a stave design on white. 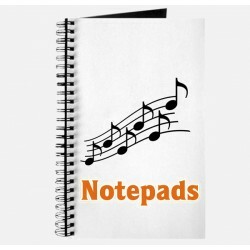 Size: 13 x 10 cmΜι..
Notepad Sheet music midi magnetic Vienna World Μαγνητ&iot..
Silhouette Pocket Notebook: Electric Guitar Red. ΗΛΕΚΤΡ..
Music themed notebook portfolio decorated with musical instruments an idea musical gift for any musi..
Notebooks are part of our range - a quality collection of music-related gifts, including stationery,..